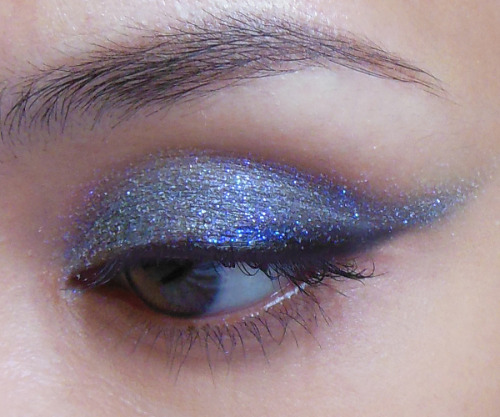 Because Maybelline's Color Tattoo shadows were SUCH a great product to use as glitter base, I couldn't resist doing a second version in a slightly winged out kitten-eye shape. 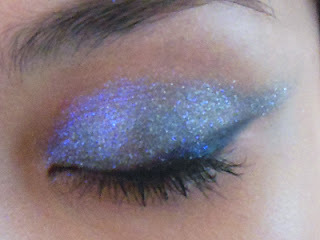 This time, I used a grey base (Audacious Asphalt) and a crystalline white glitter with a violet sheen on top. I had a lot of trouble capturing the true color of the glitter (Virgo by Lime Crime) in flash. It kept showing up white in the camera, although it's a violet in real life. 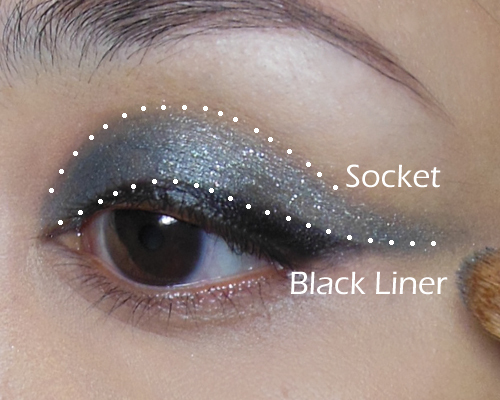 Step 1: First, I did a simple black liner swatch along the upper lid. 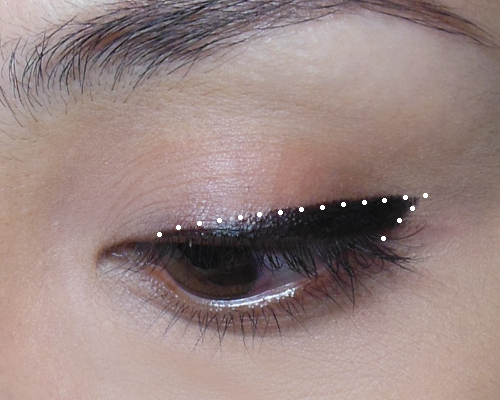 Do it in a rough triangle so it's thick at the outer corners. Step 2: Here's the fun step. You apply the grey shadow using a synthetic concealer brush, and you want to line it up exactly above the black liner you did earlier (overlapping a tiny bit is fine) and then drag it out past the outer corners of the eye. This actually scrapes the black and pulls it out into a nice sharp wing. The grey should go up to the hollow of the socket line, so continue to apply if that stroke with the brush did not cover everything. 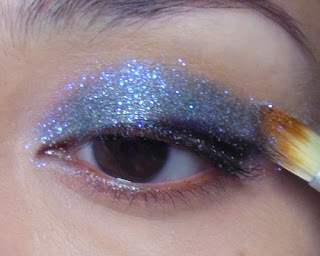 Step 3: The simple part is the glitter. Just quickly use the same brush to press a thin layer of pale white/violet glitter over the grey cream shadow. Step 4: Finish with black mascara. Because the glitter doesn't really go down to the base of the lash line, you can easily wear half-strip lashes with this look for some extra drama. It's quite a neutral look but there's just that bit of extra sparkle in a different color when your eyes catch the light. To show you how the duochrome looks, I have an image taken in shaded interior lighting (daylight) as well. Grey, but not grey! Thank you! Hope you're having a great new year so far? I love this...great shade of color! Thanks Claire! It did turn out more dramatic than I'd expected LOL. Probably doesn't show as well in pictures.